Hugh Lee Pattinson (25.12.1796 – 11.11.1858) was a remarkable chemist and industrialist, a successful innovator in several different fields. Born in Alston, son of a Quaker tradesman, in 1825 he became assay master to Greenwich Hospital, mineral rights owners on Alston Moor. 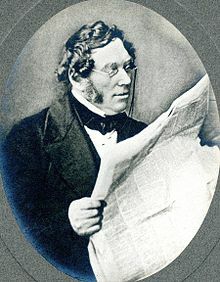 Here he developed the famous Pattinson Process which he brought successfully into production at Blaydon following his appointment to manage the Beaumont lead mills and silver refinery in 1831. Elegant and simple, the Pattinson process (patented by him in 1833) used the different temperatures of crystallisation of lead and silver to produce silver-enriched lead which could be refined in the traditional manner to extract silver. The first advance in the technology of silver refining for hundreds of years this transformed the economics of silver production. With the Pattinson process silver could be profitably extracted from lead containing only a few ounces per ton of silver. In 1834 Pattinson resigned his position to establish a chemical works at Felling, followed by another at Washington, County Durham. Pattinson patented and put into production a new method of making white lead and another for making magnesia. The Washington works became the world’s largest manufacturer of magnesia chemicals. In 1852 he was made a Fellow of the Royal Society. He lived at West Boldon, Gateshead. In 1857 he returned to Alston to lay the foundation stone of the Town Hall. Two of his daughters married famous industrialists with whom Pattinson had business partnerships – the ironmaster Isaac Lowthian Bell and the ropemaker R.S.Newall.